We recently characterized Winnie mice carrying a missense mutation in Muc2, leading to severe endoplasmic reticulum stress in intestinal goblet cells and spontaneous colitis. 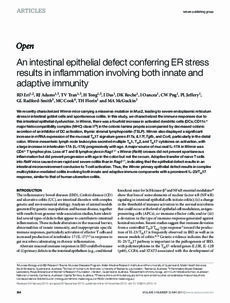 In this study, we characterized the immune responses due to this intestinal epithelial dysfunction. In Winnie, there was a fourfold increase in activated dendritic cells (DCs; CD11c(+) major histocompatibility complex (MHC) class II(hi)) in the colonic lamina propria accompanied by decreased colonic secretion of an inhibitor of DC activation, thymic stromal lymphopoietin (TSLP). Winnie also displayed a significant increase in mRNA expression of the mucosal T(H)17 signature genes Il17a, IL17f, Tgfb, and Ccr6, particularly in the distal colon. Winnie mesenteric lymph node leukocytes secreted multiple T(H)1, T(H)2, and T(H)17 cytokines on activation, with a large increase in interleukin-17A (IL-17A) progressively with age. A major source of mucosal IL-17A in Winnie was CD4(+) T lymphocytes. Loss of T and B lymphocytes in Rag1(-/-) × Winnie (RaW) crosses did not prevent spontaneous inflammation but did prevent progression with age in the colon but not the cecum. Adoptive transfer of naive T cells into RaW mice caused more rapid and severe colitis than in Rag1(-/-), indicating that the epithelial defect results in an intestinal microenvironment conducive to T-cell activation. Thus, the Winnie primary epithelial defect results in complex multicytokine-mediated colitis involving both innate and adaptive immune components with a prominent IL-23/T(H)17 response, similar to that of human ulcerative colitis.